Otto Laird lives a peaceful existence in Sweden with his second wife, only disturbed by his ill health and failing memory. When he receives news that one of his finest architectural accomplishments, Marlowe House in London is set to be demolished he decides to sit back no more. He makes a few phone calls, re-acquaints himself with some old contacts and starts the ball rolling for an appeal on the destruction of the building. When he’s informed that the best chance of saving the 1960’s development is to participate in a documentary on the building and its inhabitants Otto isn’t so sure. The London area is well known for crime, would it be safe? Is he even well enough to travel after his last operation? In the end, he decides he must do everything he can to save the building so against his wife’s wishes he heads back to the London streets he used to call home, to live inside one of his greatest creations. But what will he find when he gets there and is it really just the building he wishes to re-visit? When you first feet Otto you cannot help but see him as a frail old man, losing grip of what made him famous, what made him unique. As you speed through the pages (and you will) you unravel his complex and touching story to realise he his far from this and is a man rich in history, love and passion for life. Due to its main character being an older gentleman I am sure this will draw comparisons to The Pilgrimage of Harold Fry but Otto really deserves to be appreciated in his own right. The descriptions of his darkened childhood, living hidden from Nazi persecution in a family friends cellar is enough in itself to make a fascinating read but to layer that with the years that lead from that to his retirement make it utterly captivating. This novel really will have you on the verge of tears one moment and laughing out loud the next, the storyline concerning his previous wife is especially moving and handled with great care. 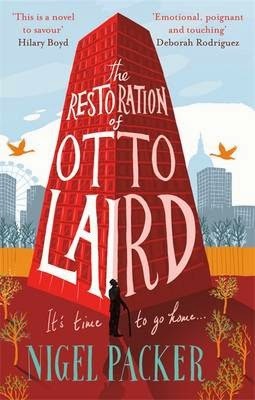 Overall The Restoration of Otto Laird is a joy to read and is sure to warm hearts across the UK and beyond.